This week, as students begin working on final papers, projects, and exams, many at Augsburg are looking forward to two holiday traditions that highlight the College's Scandinavian heritage and share the gifts and talents of the Augsburg community with others. These two annual events are the traditional Scandinavian Velkommen Jul celebration hosted by the Augsburg Associates on November 30, and Advent Vespers, a service of music and liturgy which features the musical talents of Augsburg's instrumental and choral ensembles on November 30 and December 1. Velkommen Jul begins with chapel service at 10:20 a.m. and moves to the Christensen Center from 11 a.m. to 2 p.m. The event, rumored to be one of the largest gatherings of Norwegian sweaters in the country, includes Scandinavian music and foods such as krumkake (a Norwegian waffle cookie) and lutefisk (dried whitefish prepared with lye and butter), handcrafted items, and a visit from St. Nicholas. Advent Vespers celebrates the beginning of the holiday season with a service of traditional and contemporary hymns, anthems, and carols. The Augsburg College Advent Vespers celebration is one of the largest holiday music events in the Twin Cities with more than 10,000 worshipers participating annually. Held in the beautifully renovated Central Lutheran Church in downtown Minneapolis, this event features more than 300 participants including choirs, instrumentalists, readers, and a full liturgical party. Want to make some of those tasty treats at home? Find recipes, courtesy of the Augsburg Associates, in the Fall 2009 issue of the Augsburg Now magazine. The Augsburg College Associates is a service auxiliary of volunteers, including alumni and friends of Augsburg, whose mission includes fundraising for special projects and scholarships in support of Augsburg College. Throughout the year, the Associates manage estate and moving sales in the Minneapolis and St. Paul metro area. During the past two years, they have also had a booth at the Taste of Augsburg event held Homecoming weekend. The Associates have given to Augsburg more than a half million dollars from their fundraising. Snap a picture of you and your friends at Velkommen Jul and/or Advent Vespers and share it with @AugsburgCollege Facebook, Twitter, or Instagram. 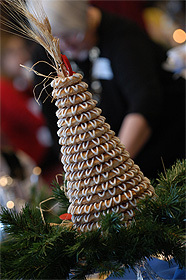 PHOTO: Kransekake (ring tree cake) is a Danish and Norwegian dessert traditionally eaten on special occasions.